It&apos;s been a bicycle month in Los Angeles. From the LAPD getting together with Critical Mass to the installation of sharrows, even if controversial. 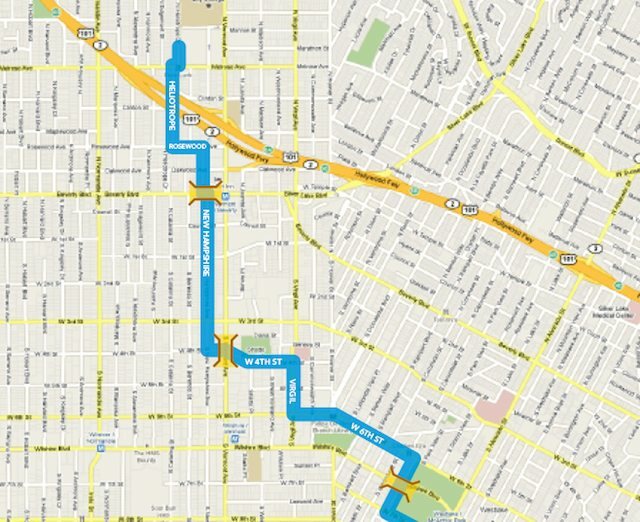 Last Friday came the news that CicLAvia was really happening, coming to Los Angeles in September. "For the uninitiated, the city of Bogota put on the first Ciclovia decades ago by closing several of its main streets to cars and opening them to pedestrians and cyclists on Sundays," explained LA Streetsblog&apos;s Damien Newton last year. "Over the years, a culture developed around these gigantic street parties. Citizens literally pack the streets taking their bikes, joining group exercises and dances or just taking a walk free from the interference of the automobile." In the United States, we've seen Ciclovias in New York City, Portland and most recently in San Francisco. It's about time for Los Angeles, right? L.A.'s event, which organizers are hoping can turn into a bi-monthly event to start, is on Sunday, September 12th from 10 a.m. to 3 p.m. Full details and the nearly finalized route are all on the organizer's blog.